MY LIBRARY OF THOUGHTS: What's The Best Book You've Read In One Day? As a reviewer and writer, it's part of perfecting my craft. I once had a book blogger friend ask me how many books I've read in my lifetime. (Hey, I'm not that old!) I couldn't even begin to come up with a number. But I'll make a guesstimate. I usually read 4-5 books a month. For sure. But then it even depends on how fast I finish reading those books. Sometimes I even read 10 books each month. So last week, when I noticed the #1daybook hashtag on Twitter, I had to find out what all the fuss was about. Looks like it started over at Reddit when someone posed the question: What's the best/most unusual/longest/most enthralling book you've read in a day? It got me thinking. What's the best book I've read in a single day? What book has kidnapped me, held me for ransom, and refused to let go until I closed the back cover? 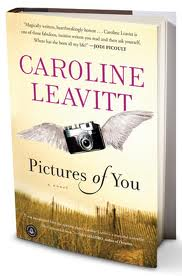 My answer: Pictures of You by Caroline Leavitt. She had me on page one, and by the time I finished a few hours later, I was a blabbering book reader, tugged in multiple directions by conflicting emotions. I felt such a connection with Isabelle, the photography, the sense of place. I think about that book often, pull it from the shelf and reread snippets - a snapshot of descriptions and characters - that beg to be read once again. It takes a special book - and writer - to create that sense of empathy with readers. And Caroline's words and story formed that bond for me. What's the best book you've read in a single day? 19 Minutes by Jodi Picoult. She's a poor writer but every now & then has a brilliant book.19 Minutes helped me get over high school, how pathetic that sounds, it's true. I sat down on the couch in the morning and did not get up, even to eat, all day. Riveting.